Good news for you folks who are NOT soccer fans: this is my last World Cup-themed set of digital papers. 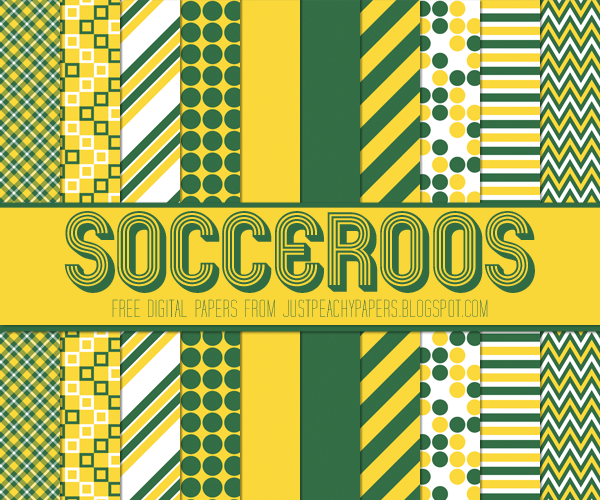 Australia fans, I'm sorry I'm only now publishing it when The Socceroos are already out of the tournament. But take heart - they made a good showing in a very difficult group. Maybe 2018 will be their year! This set of digital paper features 10 12x12 inch papers in green and yellow. Just click the above image to download. Feel free to use these papers for any scrapbooking, crafting and digital design projects. You can also use them commercially, just please provide credit to Just Peachy Designs and include a link back to this website.